Happy almost 4th! I just wanted to pop in really quick and share with you what I’ll be wearing for tomorrow’s festivities. We decided to have a casual 4th of July, which means we are not going away, just hanging out with your friends here in Napa Valley. Low key is where it’s at! Czesc! Jutro w Ameryce swietujemy Dzien Niepodleglosci, w zwiazku z czym w dzisiejszym poscie kroluje czerwien, niebieski i biel. 4 lipca obchodze juz 5 rok z kolei tutaj w Ameryce i nadal nie moge uwierzyc w to jak mnie zycie tu ponioslo. Zawsze w koncu do tego dazylam, jednak czasami ciezko sie nadziwic jak marzenia sie spelniaja! Nadal pamietam jak studiowalam w Krakowie na amerykanistyce i tylko sobie marzylam po cichu by swietowac Dzien Niepodleglosci z Amerykanami. A teraz to sie wydaje takie oczywiste…. I hope you’re all having a fantastic (long) holiday weekend! I like casual sets the most. It just has to be comfortable. I noticed you chose the colors of American flag. I’m in love with the heels. Love this outfit!! So comfy and chic!! Perfect 4th of July look! Loving your red white and blue. Hope you had a wonderful holiday. So cute, lady- and the blue mules were such a nice touch! Really cute outfit. Love the casual and chic vibe. Great shoes! Such a cute 4th of July look!! I just love your jeans! It’s hard to find great petite jeans! This is such a cute look! I love your blue mules! 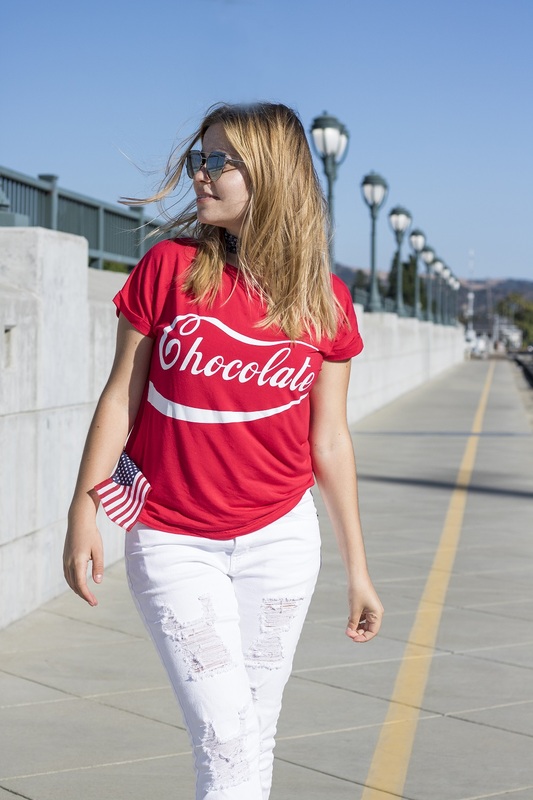 Hehe I totally thought that it was a Coca Cola tee until I looked a little closer and realized it said chocolate! Even better since I don’t like coke and I love chocolate lol. I love that your fourth of July outfit wasn’t you in a full on flag but that you incorporated the red, white and blue into your outfit!